I thought I might continue with the subject from the last post today. 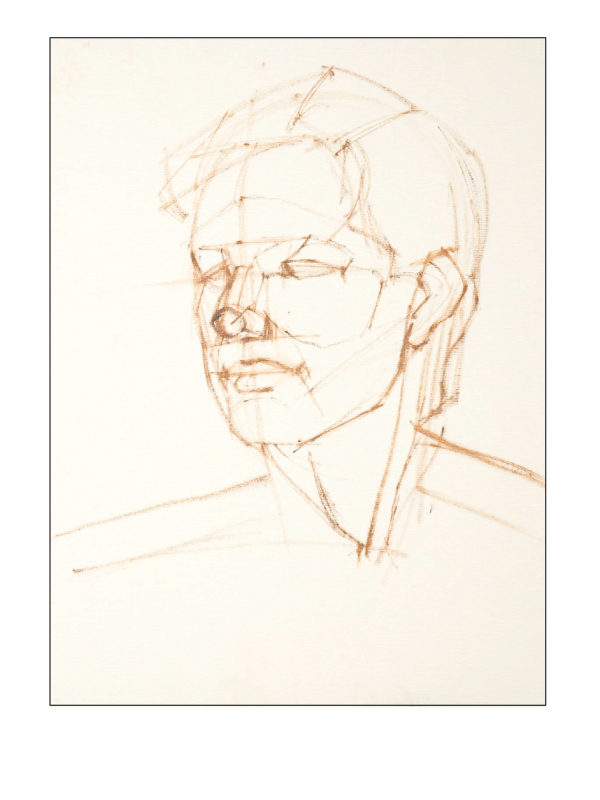 In the last post I demonstrated how to start a portrait drawing by setting up the simple structures and then defining the plane changes of the surface using a charcoal pencil. This time around I want to apply the same techniques and concepts to painting in oil paint. 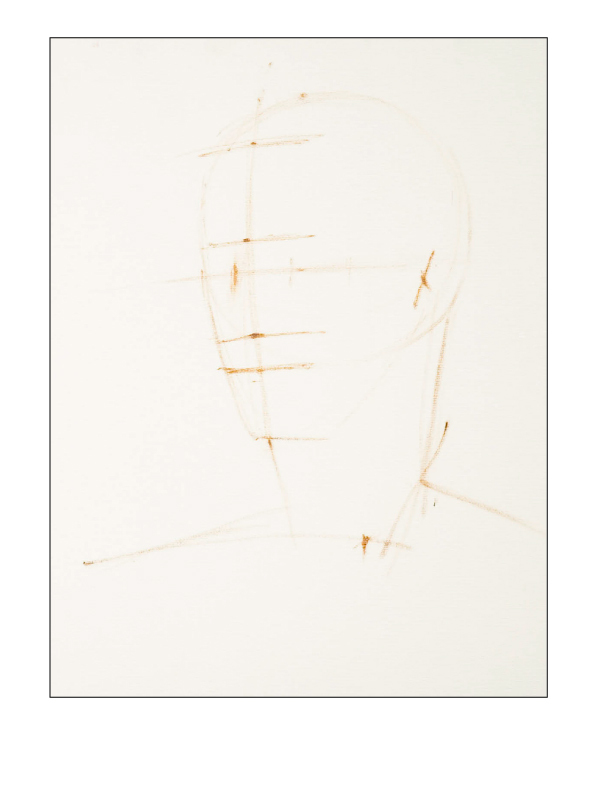 Today, we are going to set up a portrait painting like we did for the portrait drawing in order to highlight the similarities and differences between the two mediums. We will start by with the materials used. 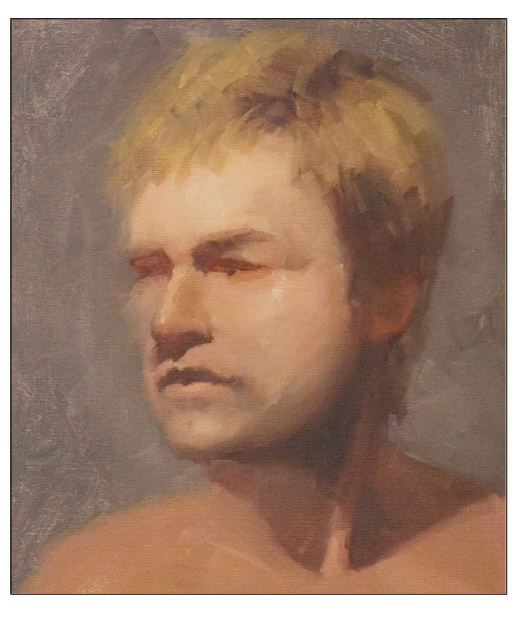 For this exercise I am working on a 12 x 16 inch white primed canvas with a small bristle brush. 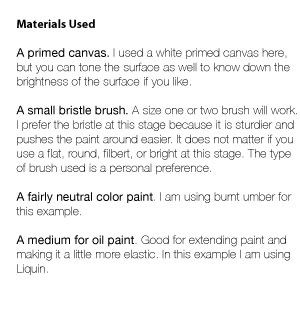 I like a size 1 or 2 flat brush, but any shape is fine. 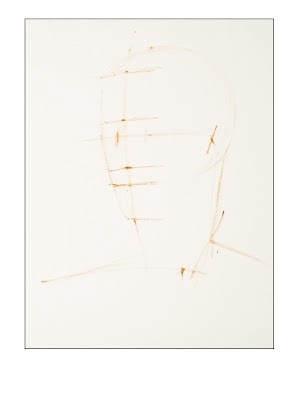 I am also using the color burnt umber to draw the initial stages of the portrait. I prefer a neutral color because the paint will influence the other colors laid down on top later on but you can use any color you like. 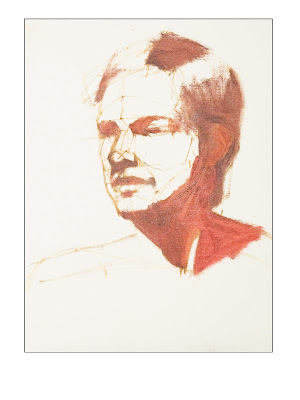 Using this process as a way to start a painting, the first steps of painting are basically drawing. We are doing the same steps we did in the earlier post but instead of a pencil we are drawing with the paint and brush this time. 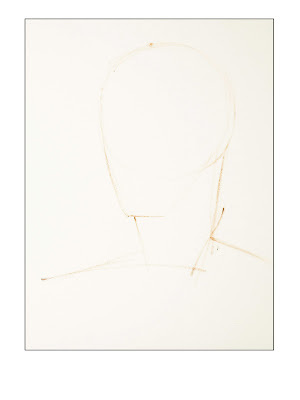 I will sketch in the basic shape of the head to get size and placement on the canvas. There are times where I find that my paint doesn't stretch as far as I would like on the canvas. Sometimes I will add a little medium to loosen the paint a bit so that it is a little more elastic and makes for smoother drawing. 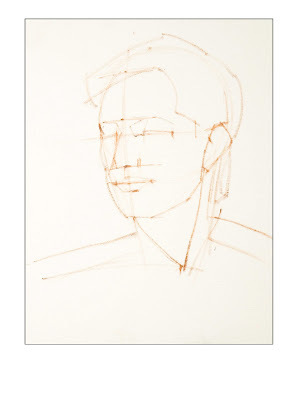 This step is really no different then when drawing with a pencil. Just locate and mark the position and size of the features. Then check to make sure everything is proportional. If I need to move a mark or line, I can remove the old one in a couple of ways. I can remove it by taking a rag an wiping it off, which will leave a trace of the paint, but clean up the painting enough for me to know which marks I am using and which I am not. The other option is to use a little turpenoid to remove it. This will remove more of the paint but this can make it trickier to paint as there is still solvent on the canvas and that can disrupt new paint if one is not careful to remove the turpenoid thoroughly. The last option is to just leave the old mark and paint over it later. This is the option I prefer as you will notice that I leave the original marks in after making changes. I like this approach to corrections because it is faster for me. 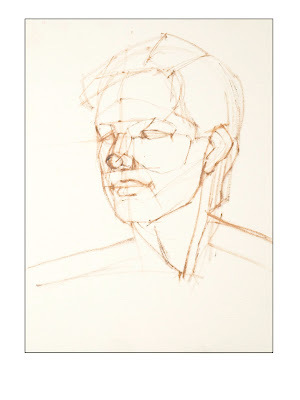 Here we start defining the shapes of the features and forms a little more clearly. I try to keep the marks light because the forms are still fairly simplified and I will be reworking and refining the lines later. I don't want to get too much paint down early on because it can get messy and confusing if there are a lot of heavy lines and marks painted on the canvas. Once again, still doing the same thing as in the drawing. We refine the plane changes and the shapes of the forms, working towards the smaller shapes. 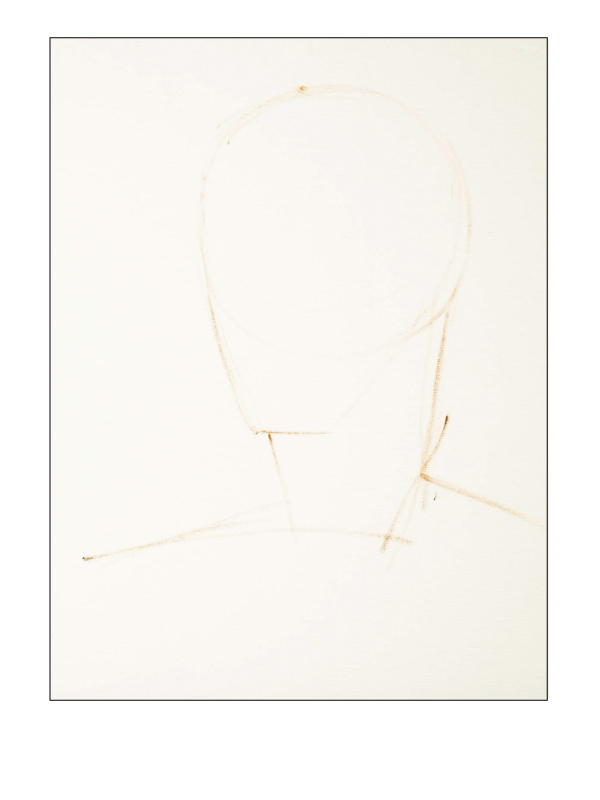 I draw the forms to the level that I feel gets me enough of the structure information I need to paint or model the forms later on. 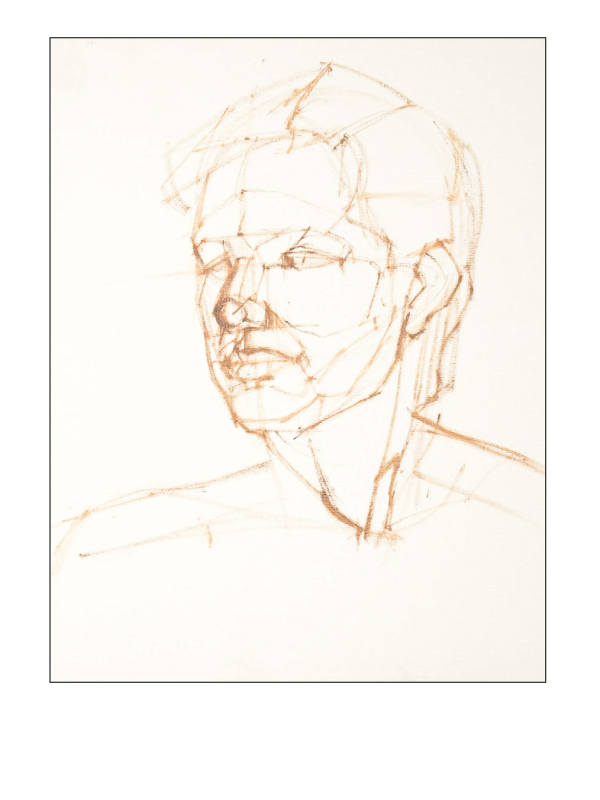 This is the final version of the initial drawing in preparation to paint the portrait. Everything is in line at this stage and I am ready for the next step. Here I included the boundaries for the shadows was well. This leads me into the next step. The next step I do is paint in the shadow areas on the head and neck. 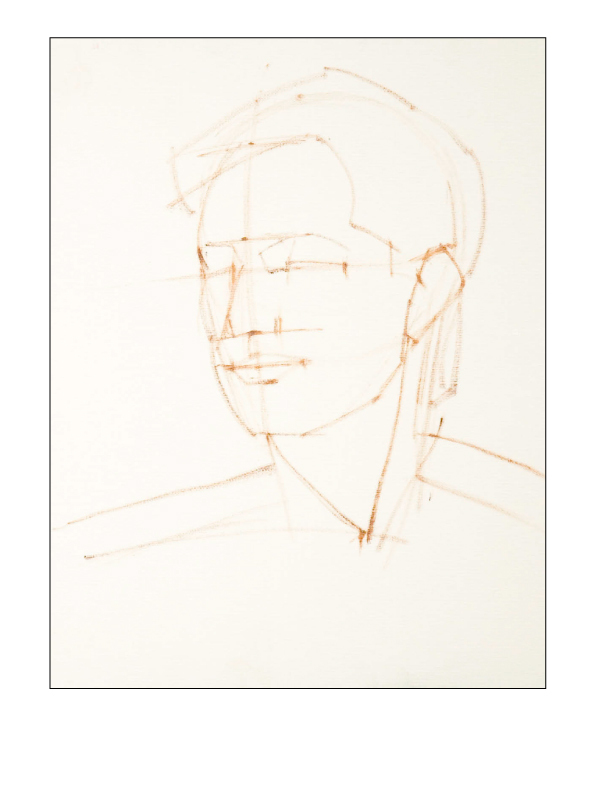 I am saving the rest of this demonstration for another post, but I thought I'd show this step to demonstrate why we set up so much in the drawing stages of painting. The more we work out the shapes, forms and proportions in this stage, the less we have to worry later on. brilliantly explained!! will learn a lot from you. Bless you for sharing your art with the world in such a selfless manner.